Also serving Katy, Sugar Land and surrounding areas. At Best Dental, we offer high quality Dental Implants for prices unmatched in the greater Houston area! For only $1,999 (cash fee) you can get everything included to help you chew and function again: Implant, abutment, and crown. If you find yourself with a missing tooth, consider this option to help you replace your teeth. Below are common questions we are asked about dental implants. If there are any questions you may have feel free to reach out and give our office a call. Not at all. In fact, after they are placed most people return to work the very next day. Some swelling and discomfort may be felt after the procedure, but with proper medication this is handled fairly well by most people. They are very safe. Because the material they are made of is titanium, the bottom freely accepts this implants and helps it fuse with our own bone structure. Since it is considered a minimally invasive surgery when they are placed, risks of infection, bleeding, and numbness will be there, but at an extremely low rate of occurrence. Whether you are a young adult or an elderly man, dental implants are not only safe, but they can improve your overall general health. Some dental and medical insurances cover a portion of your dental implant. Depending on the plan, a certain percentage may be paid by your insurance carrier. Come visit us at Best Dental so that Dr. Jasmine and her team can inform you if your particular plan falls under this category. Are Dental Implants permanent or are they removable? They are a permanent replacement option for your missing tooth or teeth. The titanium cylinder fuses with our own bone structure and acts analogous to our own tooth roots to stabilize the crown that is placed on top of it. Dental Implant placement at Best Dental with Dr. Jasmine Naderi. Can Dental Implants fall out or fail? They can. Around 98% of implants placed are successful up to 10 years, but there are cases of implant failure where the implant just does not integrate with our own bone tissue. Risk factors such as diabetes, smoking, and systemic illnesses reduce the chance of dental implant fusion and success. Can Dental Implants cause health problems like cancer or other illnesses? No they can’t. Since the core of the dental implant is composed of titanium, it is freely accepted by the body. There are no studies that has linked implant placement with any systemic illnesses. What are the procedures in placing an implant? A treatment plan along with a 3D scan (x-ray) is performed to accurately measure if you are a candidate for dental implants. A thorough medical history is also performed to see if there are any contraindications in your health history. Diseases like multiple myeloma, osteoporosis, and previous radiation treatment to/and near the jaw area are some of the major contraindications to dental implant placement. Once the treatment plan is complete and your scan is analyzed, we will prepare you for dental implant placement whether its that same day, or another day of your liking. The dental implant placement is prepared with a set of rotary files that form a socket where the implant is to be placed. Next, the dental implant titanium cylinder is slowly placed into this open socket using a specialized dental hand piece. Once the implant is placed in the proper position, we will determine what material to cover it with. If the implant is placed and is very stable, we place a healing abutment (also known as healing caps). If the implant placement shows that the implant is loose and not that stable, we place a a cover screw to allow the dental implant to integrate with your own bone tissue (this takes a period of 4-5 months). After a period of around 4 months, we take an impression of the dental implant. This impression goes to our state of the art laboratory who constructs a custom made dental crown that sits on top of your dental implant. The crown or cap is either cemented on or screwed into place. These are the main steps in implant placement. As you can see it really is not too complicated, and most of our patients have an easy recovery process after dental implant placement. Yes they can. There are rare occurrences of dental implant breakage. 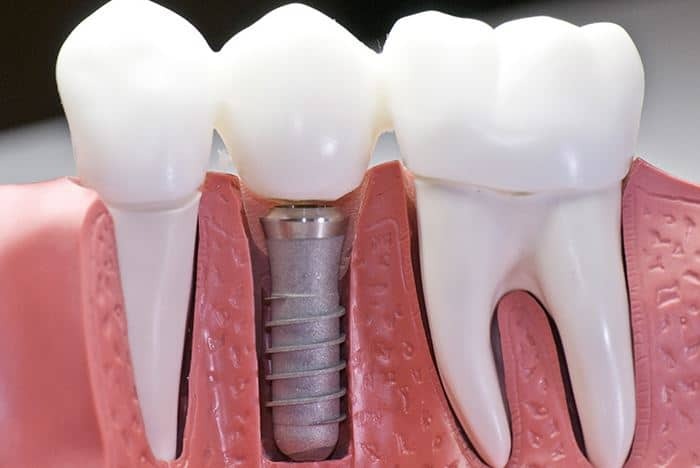 The majority of the time, the break occurs in the abutment that connects the dental implant and the dental crown, and all we would have to do is replace that part. If the dental implant itself breaks, then we would have to remove it, and place another one some time in the future. They can certainly replace your traditional denture that uses only your gum tissue to stabilize itself. With dental implants, there are two main type of specialized dentures that can be constructed. The snap-on dentures also known as Implant-Supported-Overdentures and/or a permanent denture that cannot be removed from the mouth called a Hybrid denture. Both options are available, and during your consultation appointment, Dr. Jasmine Naderi will let you know which type of implant prosthesis is best suited for you. How do dental implants work (how do they stay in place)? Once dental implants are placed into your bone tissue, there is a chemical bond that form between your own bone and the titanium that resides on the surface of the implant. This chemical bond takes around 3-5 months to completely form and stabilize. Afterwards, the implant is stable and ready to receive its corresponding dental crown or cap. They are mainly composed of titanium, which is an element or material that is freely accepted by the body. The same material is used for procedures like hip-replacements, and knee replacement surgeries. Are there any age limitations on implant placement? There are absolutely no age restrictions. The key factors that we look at when determining if someone is a good candidate for a dental implant is his or her health history and the quantity (how much) bone they have in that area. Once again, age plays no role in our treatment planning phase. What are the financing options available in getting an Implant? At Best Dental, we offer many forms of payment. Pay as you go: Since there are 3 stages in dental implant placement and the corresponding dental cap placement, costs can be broken down into three payments if this is the route you want to take. Third Party Financing: A secure third party source (Care Credit, Lending Club, and many others) can be used to finance your dental implant. Most of these programs allow for no money down payment, and minimal monthly payments at zero interest. One up front payment: This allows you to save even more. Ask us about this during your consultation visit. We accept most forms of credit card payments, cash, and checks. Please speak with our finance coordinator during you visit for more details. Will there be any additional costs to the dental implant procedure? There may be. If someone does not have enough bone volume, additional procedures such as bone grafting may be necessary to prepare the site for a dental implant. 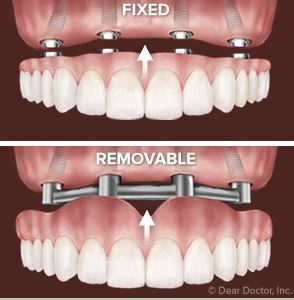 A bone graft is a material which helps the body stimulate lost bone in the area where we want to place your implant. If we determine that you will need that area grafted before implant placement, we will inform you during your consultation visit. The costs of the bone grafting procedure will also be given to you at that time. How long do I have to wait after my bone grafting procedure to get my Implant? We usually recommend at least 4-6 months. This way, your body has time to completely heal and make the adequate bone that is needed to receive your dental implant. Just like your own tooth can get infected, dental implants can also get infected and fail. Although this rarely happens, we do see it from time to time. Uncontrolled diabetics and smokers are at higher risk of this complication than most others. Why are smokers and diabetics at higher risk of implant failure or infection? Dental Implants need a good blood supply for them to integrate properly with your bone tissue. Diabetics and smokers slowly lose their blood supply in these areas making this fusion between the implant and bone more difficult. Although the chances of failure is still low, compared to the rest of the population the chances of implant failure is still higher. We hope this page is given you a solid educational foundation of what dental implants are, how they work, and what risk factors there are in placing them. Dr. Jasmine Naderi, and her dental team will let you know if Dental Implants will be right for you at your consultation appointment. To learn about this treatment, please visit Dr. Jasmine at Best Dental today.